This program prepares students for position such as management trainee, first line supervisor, and higher levels of management for either profit or non-profit organizations. Emphasis is placed on developing interpersonal and conceptual skills such as motivation, communication, performance appraisal, decision making, and problem solving. 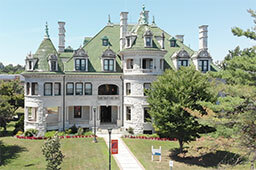 Various business courses including accounting, computer information systems, and law; as well as liberal arts courses are integrated into the program. Focus is also placed on entrepreneurship for those interested in operating their own business or applying this managerial approach in a medium to large organization or in the public sector. It is the mission of the Orange County Community College A.A.S. Business Management Program to prepare the students in its curriculum in such a manner that they may graduate and be able to obtain a position in the business world. Students will integrate management theories and tools in a variety of functional areas within an organization. Students will demonstrate the ability to use a variety of sets of analytical tools in various functional areas of business. Students will express business ideas and information effectively in both oral and in written forms. * Students with sufficient keyboarding ability who pass the keyboarding waiver exam will fulfill this requirement, they do NOT need to replace the 1 credit. *** Students can take ACC 153 in place of ACC 101 & 102. Additional Business elective needed when taking ACC 153.